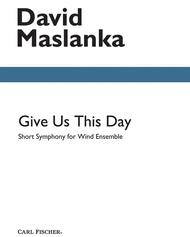 Give Us This Day (Short Symphony for Wind Ensemble - Full Score and Parts). Composed by David Maslanka. Concert Band. For Piccolo, Flute I, Flute II, Oboe I, Oboe II, Clarinet I, Clarinet II, Clarinet III, Bass Clarinet, Contra Alto Clarinet, Bassoon, Alto Saxophone I, Alto Saxophone II, Tenor Saxophone, Baritone Saxophone, Trumpet I, Trumpet II, Horn I, Horn II, Horn III, H. Carl Fischer Classic Band Editions. Score and Set of Parts. Standard notation. 80 pages. Published by Carl Fischer (CF.J757).ISBN 0825864933. With Standard notation. 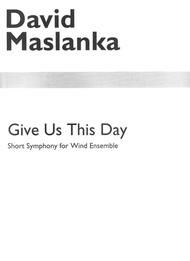 Give Us This Day (Short Symphony for Wind Ensemble - Full Score). Composed by David Maslanka. Concert Band. For Piccolo, Flute I, Flute II, Oboe I, Oboe II, Clarinet I, Clarinet II, Clarinet III, Bass Clarinet, Contra Alto Clarinet, Bassoon, Alto Saxophone I, Alto Saxophone II, Tenor Saxophone, Baritone Saxophone, Trumpet I, Trumpet II, Horn I, Horn II, Horn III, H. Carl Fischer Classic Band Editions. Full Score. Standard notation. 80 pages. Published by Carl Fischer (CF.J757F).ISBN 0825864941. With Standard notation.